Unfortunately, crimes such as burglary, arson and vandalism can occur in churches just as they can and do on business or residential properties. Fortunately however practising good security can reduce the risk of loss or damage from criminal activity, or even prevent it from occurring in the first place. Burglars tend to look for an easy target where they can operate quickly and easily. 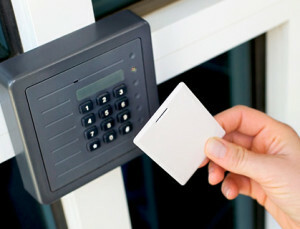 The more layers of security you have in place, the more likely they are to bypass your property when seeking targets. This can be done by implementing systems that deny or delay access and detect unwanted intrusion if it does occur. Good external lighting, and removal of ‘hiding spots’ for intruders such as overgrown shrubbery or trees. If you don’t want lights left on all night you could consider motion-sensor lighting instead. Boundary fences are important, especially of the wire-mesh variety as it allows for better visibility. Good maintenance and upkeep. A property that looks neglected may be more likely to attract vandals. Deadlocks on entry/exit doors, and locks on internal doors – especially to areas where valuables are kept. A sound key-and-lock management system – see our article on this subject for more information. Protection for windows – this could include security locks, grilles, metal bars in sliding-window tracks, and special protection for stained-glass windows. Keeping valuable items such as musical instruments and artefacts out of sight and preferably locked away when not in use. Developing procedures to be followed for cash collection and handling in order to deter internal theft. More information on this can be found here. Locking away outdoor equipment in a secure shed or outbuilding. Installing detection alarms and surveillance cameras if required. Removing flammable items and fuel sources from around the building. Our article on arson prevention provides more information on this. It’s also important that you conduct a thorough inventory of the church building’s contents not only for valuation and insurance purposes, but also to enable you to track missing items if you need to report losses from burglaries or other crimes to the police. An inventory form template can be found under our forms section (scroll down to find it). If criminals do manage to gain entrance and cause loss or damage it’s important that you do not try to tackle them yourself but to call the police for immediate assistance, or to report an incident. Safety and protection of people is the most important consideration. If you need assistance in lodging a claim for losses, contact your CCI representative.